Time to tighten your belt? Life can throw unexpected things at you for example you may wake up one day and find you have no job. We have been in that position before, having to rely on benefits whilst finding employment. This is why its important to handle your finances correctly especially with the cost of living rising. Sometimes you have to take out loans with places such as Cash Lady, use credit cards or borrow money from other sources. It is important though to monitor your spending, so that any debt doesn't spiral out of control. We need to look into what we have coming in and what is going out. Now that our situation has changed we need to start a fresh budget and see where our money is going so that we can live within our means. We need to be a lot more stricter and say no a lot more often. It's time to see if we can find cheaper alternatives when it comes to not just our utility providers but with what we eat and drink. We also need to look into new ways we can be frugal/thrifty as possible and still have fun. Even though our situation has changed it still important to put money away for emergency's. Luckily we have no debts to worry about which makes it a bit easier to do so. I'm also planning on finding new ways to save money by reading other blogs that focus on money and by joining facebook groups as there is always someone out there that may have thought of something that you may not have. 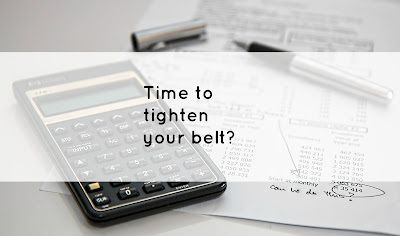 It is time for you to give your finances a shake up? It's so important to think about finances lasting for those unforeseen events. I'm terrible at keeping control over my spending and I definitely need to get better. I am budgeting quite a lot at the moment, as I am waiting to start a new job. Great guide, thanks! We live on a very tight budget, so I save money by upcycling clothing rather than buying new. I've made cardigans out of sweat shirts, tunics out of dresses I no longer wore, and clothes as gifts for my granddaughter.